God’s introduction OK now, this is the part where I begin to explain some unknown but crucially important information to each of you. This is only part of the knowledge of certain events and actions that has long been withheld from you. Codex 1 The Lives you change along the way Do you think it is possible for you as an individual to change someone’s life who may be thousands of miles away without ever meeting them? What about touching someone who is light-years away? Remember now, that pure refined energies know no bounds and that thought travels much faster than sound. This is a fact! 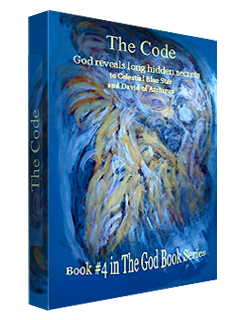 Codex 2 Uncivil Behavior OK Children; in case I neglected to tell you before…do not expect Me to epitomize sweetness or to behave in any manner that can be construed as overly laidback in this book or the remaining books of this series. Codex 3 I Speak on War War is an aphrodisiac for the mentally challenged and Spiritually deprived. Codex 4 Angels I do not want any of you to walk into your new lives here without having properly assimilated information relative to true Earth history. History that exists on all levels. Codex 5 Soul Partnerships There comes a time in every person’s lifetime when they will be faced with the choice of either honoring the agreements they originally set into motion long before incarnating here on Earth, or they will choose to break or alter the agreement to pursue other ventures. codex 6 Fanaticism and Ideology The topics I have chosen for this particular codex are particularly important because of the causal impact they have had and will continue to have on you each as human beings. Codex 7 The Four Horsemen of the Global Conspiracy I realize far better than you think I do that some topics I choose may be unpalatable to you, simply because I speak about issues that are difficult for you to bear. However, the very fact that much truth needs to be understood here, should at the very least compensate you for your discomfort. I feel that laying truth in front of you is what I need to do. Codex 8 A Snapshot for Eternity Prior to your scheduled departures from other realms to either the Earth Star planet or to another world, you are each sent many imagings which have been predetermined to be the ones to best assist you during your upcoming journeys. Codex 9 A Deterrent to the Preservation of the Realm You see Children, because the soon-to-be true NEW nature of Terra will be unveiled for all Universes to see and rejoice with, I have decided that I should share this information with the races of this world. Codex 10 The Intent of Surveillance In the defense and preservation of all of the realms We are responsible for, We who are the Creators, Co-Creators and Overseers of each Universe must always be aware of any changes within each and every movement of the realms and Universes. It must be this way in order to maintain balance and order within the Creative process. Codex 11 Machinations OK now, since a part of My mission in these books is to further instill truth in your minds while continuing to have truth displace illusions, I see no reason for Me to stop now. Codex 12 Decoding the Code Children, when you see the enemy and understand who and what it really is, then you can defeat it through sheer mind-thought. You can do this here because you are not under any constraints about “interfering in the lives of the humans.” In MY situation, none of Us here can actively intervene or interfere here UNLESS We are specifically requested to do so by you, but even then only under special conditions.